Jordan Ingram reporting for FishDuck.com at the Hatfield-Dowlin Complex in Eugene, Ore.
Last season, a freshman became well known in Eugene for his explosive offensive and special teams contributions on the football field, seamlessly transitioning into the Oregon Ducks potent offense. Now, Charles Nelson will change his role entirely. The Ducks’ coaching staff announced that Nelson would be making the switch from receiver to cornerback for the upcoming 2015-16 football season, marking the beginning of a curious experiment for the Daytona, Beach, Fla. native. On offense, Nelson has home-run potential every time he steps on the field. For Duck fans, the news of the change comes a bit of a surprise. Nelson’s cameo appearances on defense last season hardly suggested a permanent shift to defensive role. 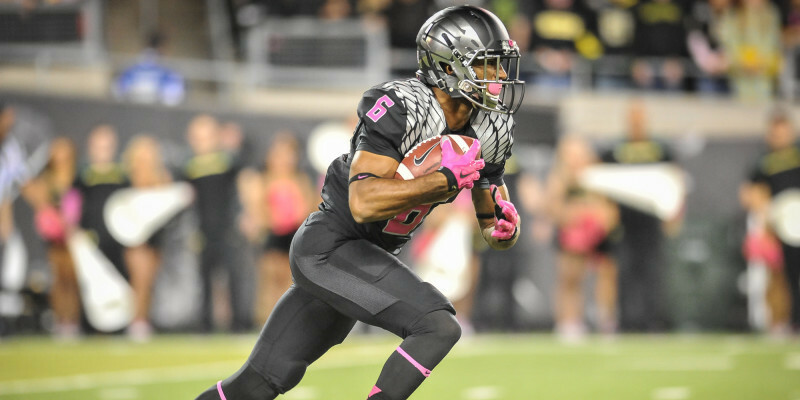 However, Oregon’s young, multi-talented athlete wants to do anything to help his team. 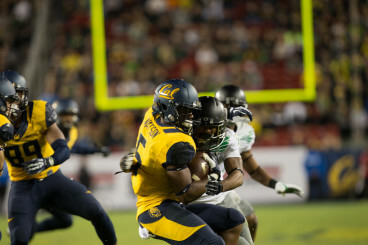 Nelson makes a tackle on a California Golden Bears punt returner in one of his appearances on defense last season. The 5’8″, 170 lb. sophomore played safety for Seabreeze high school and has demonstrated a remarkable ability to make plays in different situations on the field. 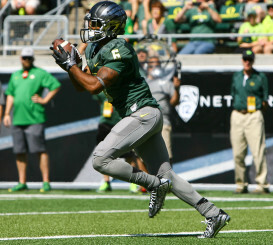 Oregon receivers coach Matt Lubick spoke to Nelson’s potential as an athlete and indicated that this could potentially become a joint venture for the young playmaker, seeing time on both sides of the ball. “We’re kind of experimenting,” Lubick said. ”[Charles] has the flexibility to play both ways. Because he does know offense and he is getting more familiar with defense. So we can have a package for him, let him develop and see what happens,” Lubick said. Ultimately, Nelson’s positive attitude suggests he feels comfortable with the decision and remains open-minded to the responsibilities associated with learning a new position. “It’s going good. It’s a new beginning. A lot of things to learn, new coaches to take advice from. I’m just learning as I go,” Nelson said.